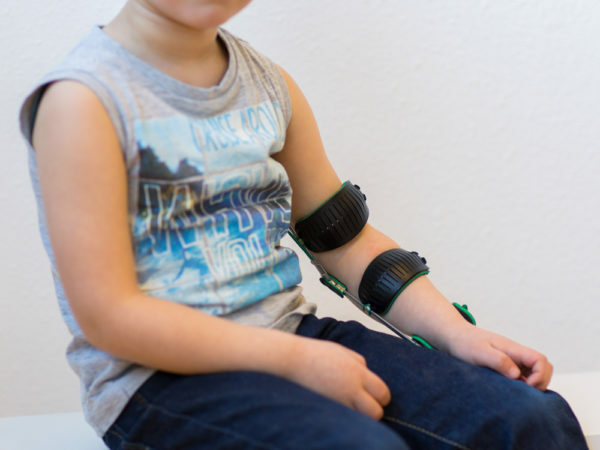 The Children’s Wilmer Elbow Orthosis (also called brace or splint) is the children’s version (as the name indicates) of the Wilmer Elbow Orthosis for adults. 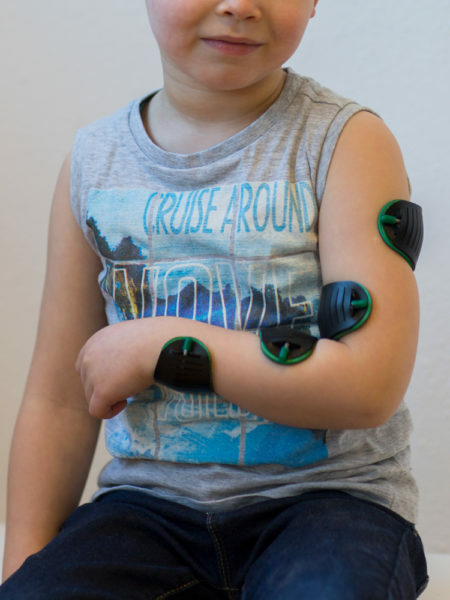 The Children’s Wilmer Elbow Orthosis (Abbreviated CWEO) is a super light and super slim orthosis intended for children who do not have enough power in either the muscles that control elbow flexion (bending) (m. biceps brachii) or the muscles that control extension (stretching) of the elbow (m. triceps brachii). 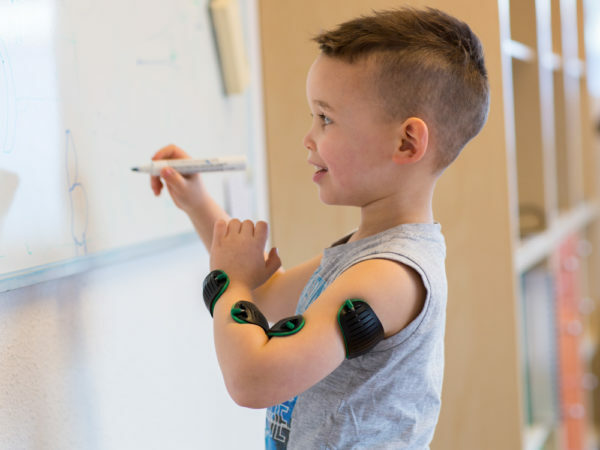 Due to a clever spring system, the orthosis helps to bend the arm (or stretch, depending on the chosen version). The spring is adjustable so that you can find just the right amount of support needed in the individual case of the child. The Children’s Wilmer Elbow Orthosis is intended for children who have a disbalance between the elbow flexor (bending) muscles and elbow extensor (stretching) muscles. Sometimes the extensor muscles are not strong enough, sometimes the flexor muscles. This may occur due to, for example, an obstetric brachial plexus lesion , also called Erb’s palsy. That condition is caused when during birth, the shoulder of the child gets stuck leading to damaging the important nerve button of the arm muscles (the Brachial plexus) in the shoulder region. The CWEO can help to increase the functional possibilities of the arm. This is important because the child develops more symmetrical motor skills which can help to reduce later negative side effects such as growth defects. An Erb’s paresis is a complex disorder involving many different factors. The treatment usually happens in a specialized team. You can request more information from the patient association. How do I get a Children’s Wilmer Elbow Orthosis? The Children’s Wilmer Elbow Orthosis is a custom-made device. For optimal operation and good comfort it is important that the orthosis fits well. After all, the child needs the orthosis every day throughout the day. Therefore, the CWEO is measured and fitted by professionals such as a certified orthotist. The CWEO is prescribed by your child’s treating physician. In most cases, this will be the rehabilitation physician. In many cases, approval from your insurer is necessary. In the Netherlands all insurers pay the CWEO provided there is a correct indication and motivation. Do you want non-binding advise from one of our clinical experts about the possibilities of the Children’s Wilmer Elbow Orthosis in your child’s situation, or do you want to know which professionals in your area have experience with this orthosis? Feel free to contact us. We are happy to assist you. The Children Wilmer Elbow Orthosis manual will be coming soon. For now you can read the manual of the Wilmer Elbow Orthosis, which is the same orthosis but bigger. How does the Children’s Wilmer Elbow Orthosis work? The elbow orthosis has a spring mechanism that helps to move the arm. Depending on the design, this spring is set to stretch, to help to stretch the arm, or set to bend and helps to bend the arm. The spring is adjustable over a wide range so that you can precisely set the right amount of support. If we make the spring too strong, the muscles that control the opposite movement must work harder to move against the tension of the spring, leading to a training situation for precisely these muscles. Since these were the muscles already being the stronger of the two groups, training them is not a positive treatment situation. If we make the spring tension too low, there is insufficient effect of the orthosis and it does not contribute enough to increasing the functional possibilities of the arm. The search for the correct adjustment is a process, and therefore your child may have to return to the Orthotic Department several times.